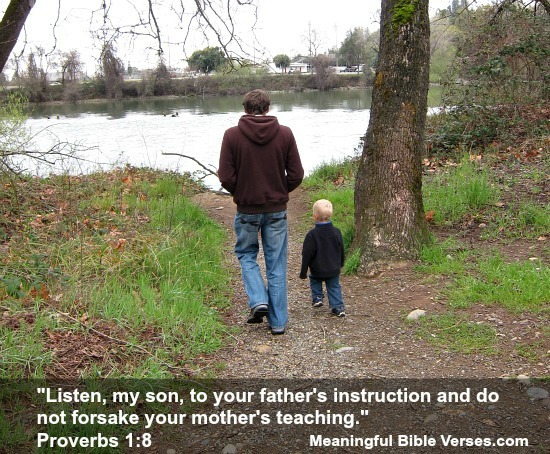 Bible verses about family can be very helpful when trying to deal with a family situation. Whether it be a family conflict or just trying to figure out the best advice to give your brother. These scriptures should help you understand the Biblical view of family. I'll start by listing some of the better known verses that talk about families and how to deal with them then I'll post some of my favorites below. I'll also link them to my commentary about the verses. Matthew 15:4 "For God said, 'Honor your father and mother' and 'Anyone who curses his father or mother must be put to death.'" Joshua 24:15 "But if you refuse to serve the Lord, then choose today whom you will serve. Would you prefer the gods your ancestors served beyond the Euphrates? Or will it be the gods of the Amorites in whose land you now live? But as for me and my family, we will serve the Lord." 1 Timothy 5:8 "Anyone who does not provide for their relatives, and especially for their own household, has denied the faith and is worse than an unbeliever." Genesis 2:24 "That is why a man leaves his father and mother and is united to his wife, and they become one flesh." Ephesians 5:25" Husbands, love your wives, just as Christ loved the church and gave himself up for her..."
As you can see God offers a lot of advice for most of the family issues we face. He gives advice for children, parents, husbands, wives and extended family as well. We would do well to study what the Bible says about family relationships before we try to "fix" them on our own.